Anders Beckman, the commercial artist and painter, studied at the Technical School in Stockholm between 1927 and 1930, and later in both Paris and Berlin. Beckman was an ardent advocate of Swedish functional design. 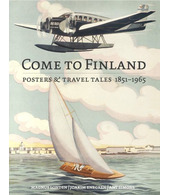 Anders Beckman’s career accelerated when he worked as a poster artist at AB Aerotransport (today called SAS). Through his pioneering aeroplane posters, he became something of an artistic spokesman for civil aviation, just as air travel was about to have its big breakthrough in Sweden during the 1930s. Today, Beckman’s name is first and foremost associated with the school that bears his name, Anders Beckman’s School (now Beckmans College of Design) in Stockholm, which he founded in 1939.